Listed below and updated daily from the MLS are condos for sale in Forest Creek, a condo development located in Mammoth Lakes, CA. 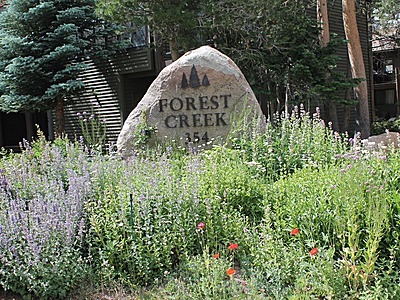 The Forest Creek condo development is located at 354 Joaquin Road, Mammoth Lakes, CA 93546, was built in 1983, and has a total of 51 townhomes. All units have the same floor plan featuring 1231 square feet, dual master suites with attached full baths on the bottom level, laundry in units, with the kitchen, dining, living room and 3/4-bath upstairs. These spacious units each have a large enclosed solarium upstairs with private spa and two other open decks (one off the living room and the other off the downstairs master bedroom). The complex is situated right behind the Tallus 5-star private residence club development and is a short walk to the green line shuttle access route to the ski area. The monthly HOA dues are approximately $550.00. For additional information on any of these Forest Creek condos for sale in Mammoth Lakes, click the "Request More Information" button when viewing the details of a property. We can provide you with disclosures, past sales history, dates and prices of condos recently sold nearby, and more. And, be sure to register for a free account to automatically receive email listing alerts whenever new Forest Creek condos hit the market in Mammoth Lakes, CA, that match your specific search criteria.